Chambal Fertilisers and Chemicals Limited is one of the largest private sector fertiliser producers in India. Chambal's efforts to achieve an all round excellence has won some of the most prestigious national and international awards. Chambal Fertilisers caters to the need of the farmers in eleven states in northern, eastern, central and western regions of India. Chambal’s Uttam Bandhan, a trend setting agriculture and community welfare initiative is playing a key role in protecting and renewing arable land by educating farmers to practice sustainable agriculture. Chambal uses a mix of both new-age as well as conventional media for providing customised information and technical know-how to the farmers. Under this initiative, farmers are using various contact points to access information on scientific farming practices, latest high quality agri-inputs and prevailing market prices. Its also helps them to locate authorized dealers, know about latest local weather forecast and non-farm business options. Most significantly, it is empowering farmers to cope with problems like nutrient-deficient soils, low water tables and indiscriminate use of fertilisers and pesticides. The interface between Chambal and the farmers are Uttam Krishi Salhakars (UKSs). The UKS is usually a local youth having entrepreneurial skills and agricultural knowledge. He is responsible for collecting soil and water samples for analysis, distribution of quarterly magazine "Chambal ki Chitthi", organising animal health camps, arranging farmers meetings, crop seminars and product demonstrations. 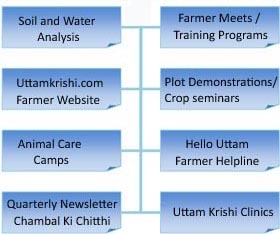 The delivery touch points for Uttam Bandhan are crop and product demonstrations, field trials, training programmes and farmer meets. The key agenda of these activities is to promote balanced use of fertilisers and advise farmers on suitable combination of nutrients for different kinds of soils. 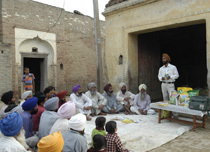 Plot demonstrations are used to showcase efficacy of Chambal products, facilitate adoption of new products and techniques and give a preview of efficient agri-practices. These sessions also act as a forum for the farmers to interact with agriculture experts. Chambal publishes a quarterly agriculture magazine - Chambal ki Chitthi, containing farm related information. This magazine is published in three vernacular languages- Hindi, Punjabi and Gujarati and is hand delivered to every Uttam Bandhan farmer. In the year 2001, Chambal launched uttamkrishi.com, a dedicated interactive website in Hindi, for the benefit of the farming community. This website has been recently revamped and re-launched with a fresh look and more comprehensive information modules. It has a bottom-up approach to farming solutions as the website has been designed region wise to address the local issues. Useful information on crops and agronomy are posted on the website. 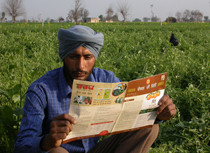 Farmers can access the information for free; and can post queries which are answered by our experts. Chambal has a dedicated telephonic helpline called “Hello Uttam”. Farmers can discuss their concerns with our experts over phone by dialing toll-free number 1800 180 5550. The helpline number is printed on all packaging and promotional materials of the Company. Soil is the single most important factor that determines crop productivity and quality, ensures long term sustainability and promotes environmental well-being. Since soil is neither inexhaustible nor self-sustaining, there is a need to test soil so that its health can be maintained and restored back. Chambal's soil management initiative is a pioneering move in this regard. 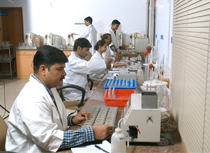 Chambal has two Agriculture Development Laboratories (ADL) at Kota (Rajasthan) and Agra (Uttar Pradesh). In addition to the two ADLs, the company has satellite laboratories at Baran, Bundi and Jhalawar in Rajasthan. Chambal also operates two mobile soil testing facilities in Kota and Kota areas of Rajasthan. In these testing facilities, soil analysis is done in-situ and instant reports are given to the farmers. These laboratories carry out soil and water tests free of charge for Uttam Bandhan members. Soil tests are done for micro nutrients and based on the reports soil mapping is done. So far, Chambal had conducted over 7,50,000 soil tests in ten states. 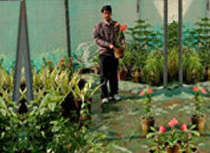 The test result data is electronically stored and is also made available on www.uttamkrishi.com. Besides soil and water tests, the two ADLs also train farmers on various issues relating to agriculture and soil health. Agricultural scientists and experts at Chambal continuously engage with State Departments of Agriculture, Krishi Vigyan Kendras, Agriculture Universities and freelance agricultural consultants to develop holistic solutions for the farmers. Livestock is an important element of a farmer's livelihood; camps are regularly organized to keep the animals healthy and disease free.